A flood of bright orange t-shirts crossed the finish line at the Race to Wrigley 5k this past Saturday, April 12th. These sunny shirts were worn by over 150 Chicago Running Mates, representing ten different schools from across the city. We had a beautifully warm and sunny morning to cap off what was a mostly chilly spring season! Many students had already completed the Pumpkins in the Park 5k in the fall and had set new goals for themselves prior to this race. Volunteers raced alongside our students or urged them on from the sidelines as many of the students met or exceeded their individual goals. 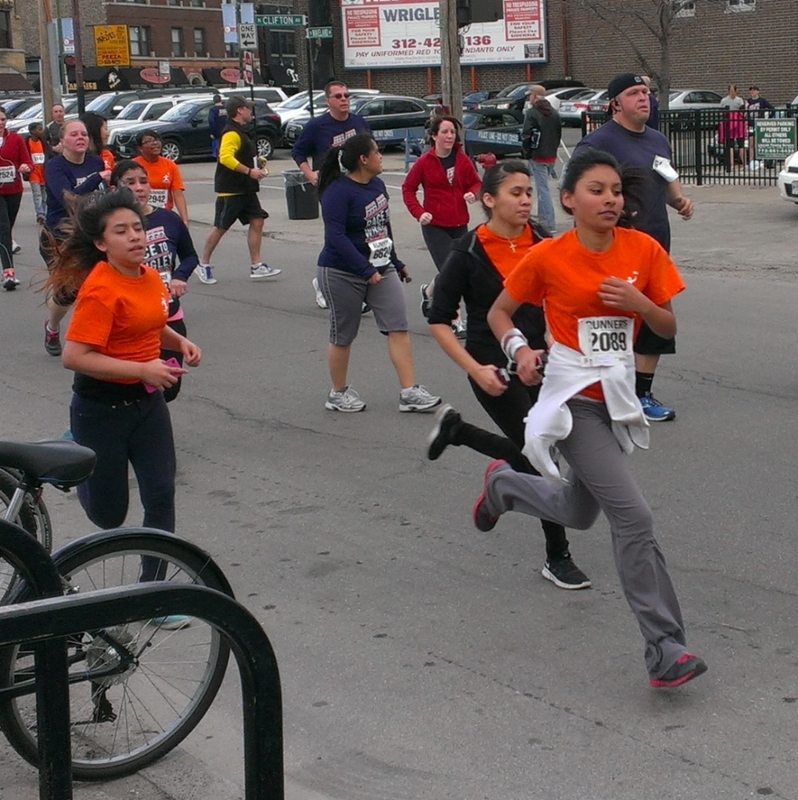 The streets of Wrigleyville were crowed with cheering onlookers, and Running Mates were all smiles as they finished and turned to encourage their classmates to run through the line. Chicago Run is thankful for the support that coaches, parents, teachers, and volunteers showed our students leading up to race day! Running Mates will head to the Cinco de Miler on May 4th to volunteer at aid stations and cheer on other Chicagoland runners. For more information, visit our Events page by clicking the button below. Running is a fantastic form of exercise, but there is a tendency among runners to focus only on aerobic development and to ignore other aspects of fitness. In many cases, this leads to overuse injuries. Incorporating other basic forms of exercise into your routine will fire your muscles in different ways, making them stronger and more resilient. Yoga, an ancient form of exercise that centers around holding full body poses, has been shown to increase range of motion and running efficiency, and is practiced by more and more runners every day. The next time it's raining, you're pressed for time, or need a break from running, take a deep breath, relax, and mix it up with this basic yoga routine. In the past decade, there has been much research into the science of stretching and warming up. Many exercise professionals now agree that it is best to perform traditional static stretches only after exercising. Since many of us have been told that stretching is a critical part of any good warm up routine, what are we to do with this new information? The answer is dynamic stretching! Dynamic stretching is a much more active, heart-pumping warm up routine, and it increases workout flexibility, mobility, and performance in ways that a static stretching routine does not. A dynamic stretching routine not only increases range of motion and encourages good form, but is a lot of fun, too! Join Coach Joshua and learn exercises that you can use in your own dynamic warm up! Running, like any form of exercise, can sometimes cause your muscles to tighten up. This post, the first of several about stretching and flexibility, will help you learn to keep tightness and soreness at bay. So find a quiet, comfortable spot and join Chicago Run coaches Casey and Izzy in our simple static stretching routine! On Saturday, October 26th, more than 150 Running Mates from 10 different schools completed the Pumpkins in the Park 5k race. 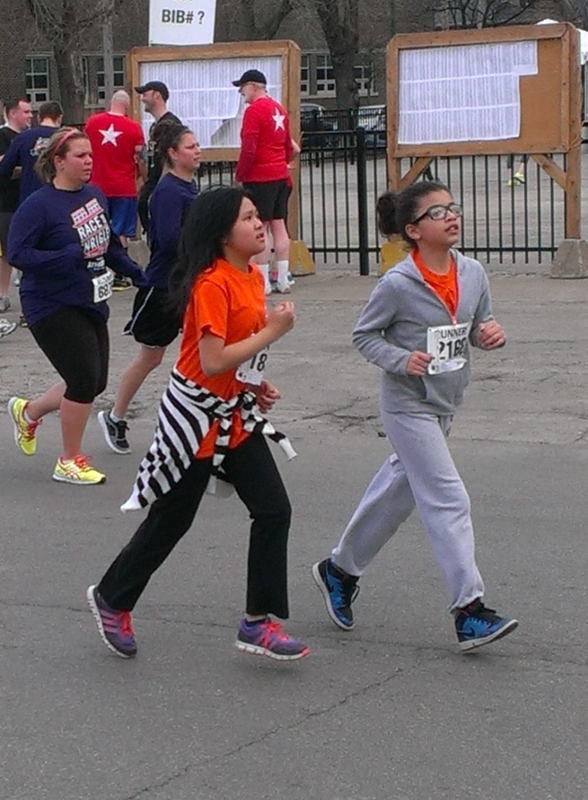 For several students, this was their first 5k race, a huge accomplishment. Leading up to the event students set goals to achieve PRs, to run the entire race or just to finish running the longest distance they had ever run. Several students met their individual goals and all Running Mates finished the race. Additionally, 25 volunteers came out to show their support for the Running Mates by either cheering the students on while they ran, or pacing them during the race. Overall, the event was a huge success, with one of our newest Running Mates coaches stating that most of her students are now, "hooked on running!" Based on the responses of students and coaches from all our teams, this sentiment is shared across the boards. Over 200 Running Mates students celebrated the end of their season by completing the All State 13.1 Marathon 5k Race. It was a perfect sunny day to run along Lake Michigan. One Running Mate finished 3rd place overall, which was an incredible accomplishment and a great way to finish the season!